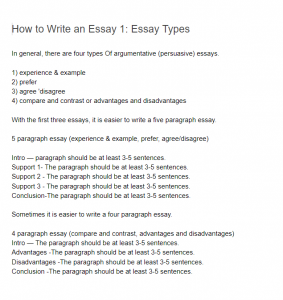 In general, there are four types Of argumentative (persuasive) essays. With the first three essays, it is easier to write a five paragraph essay. Intro — paragraph should be at least 3-5 sentences. Support 1- The paragraph should be at least 3-5 sentences. Support 2 – The paragraph should be at least 3-5 sentences. Support 3 – The paragraph should be at least 3-5 sentences. Conclusion-The paragraph should be at least 3-5 sentences. Sometimes it is easier to write a four paragraph essay. Intro — The paragraph should be at least 3-5 sentences. Advantages -The paragraph should be at least 3-5 sentences. Disadvantages -The paragraph should be at least 3-5 sentences. Conclusion -The paragraph should be at least 3-5 sentences.